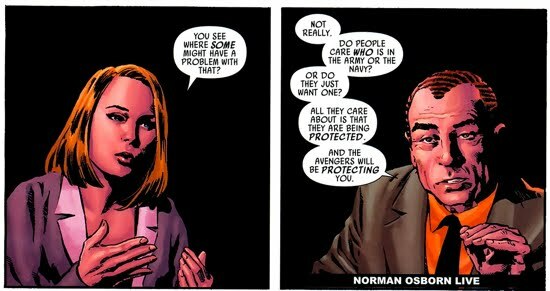 Norman Osborn did many things during his tenure as America's top cop and most of it was done to spite the numerous heros that preceded him. But arguably his most offensive deed toward Spider-Man, Iron Man, and the others was his orchestrating of a new Avengers team. A team comprised of murderers, psychopaths, and all-round despicable people bearing the iconic likenesses of tried-and-true heros. Osborn, of course, saved the piece de resistance for himself, borrowing themes from Iron Man and Captain America and hybridizing them into his Iron Patriot persona. He even stole from Thor as well, naming his S.H.I.E.L.D. replacement H.A.M.M.E.R., which was no doubt intended to mimic the strength associated with Thor's chief weapon. During Norman's Dark Reign, he and his Avengers were everywhere, battling anyone and everyone. Chapter 14 has been dedicated to tracking Norman throughout his mischievous run as the Director of H.A.M.M.E.R. 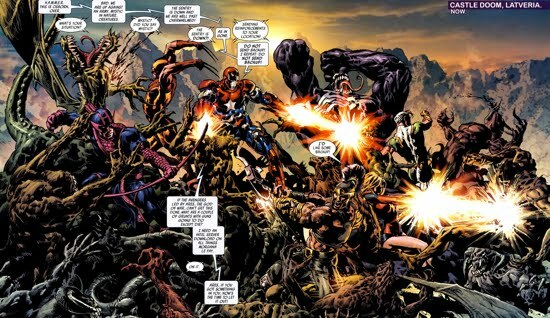 This particular section is focused specifically on the events which the Dark Avengers experienced as a team (to be blunt, this section covers the Dark Avengers title). The formation of Osborn's team is explored here. 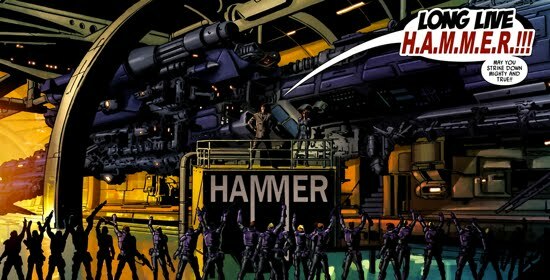 Norman got things rolling in Dark Avengers #2 after he addressed his inaugural class of H.A.M.M.E.R. soldiers, dubbed The First Agents of H.A.M.M.E.R., and apprised them of the current state of security in the United States. This battalion was comprised of loyal soldiers from his Thunderbolts Initiative as well as some promising agents from the S.H.I.E.L.D. and Hydra. 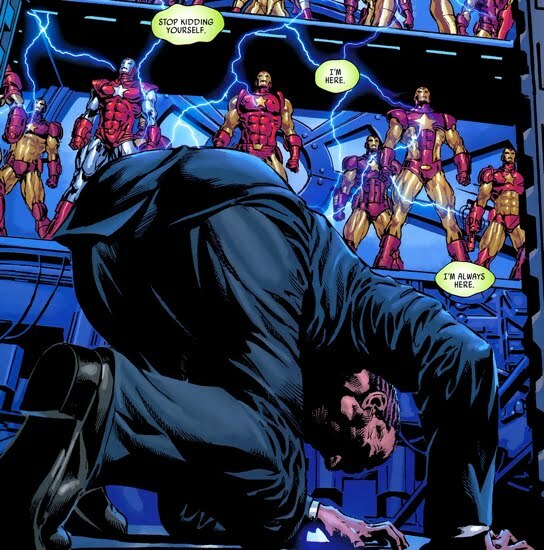 After rallying the troops, Osborn returned to Avengers Tower and briefed his newly formed team of Avengers. Norman instructed his team to never talk to the media and warned them about fighting amongst themselves, he would not tolerate either screw up. 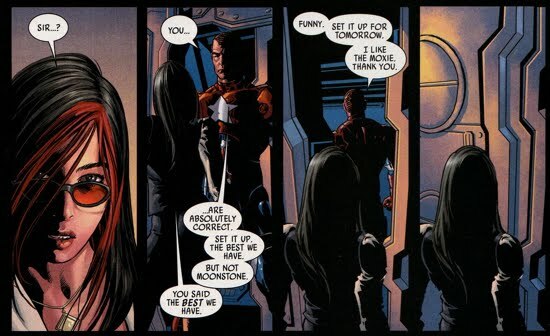 Osborn told his team he would be making a list of targets to strike and after Bullseye suggested that they go after Stark, a stern look from both The Sentry and Ares dissuaded Osborn from pursuing that endeavor. Meanwhile, over in Latveria Dr. Doom was attacked by the sorceress Morgana Le Fay who managed to hobble the seemingly indomitable Doom. 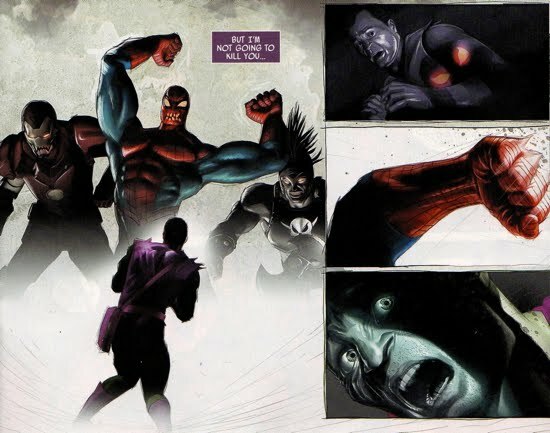 Word of Doom's struggles quickly reach Osborn and his pact with Doom forced him to intervene. Osborn ordered his team to assemble and they made their way to Latveria. Upon arriving, Osborn had no idea who Morgana Le Fay was, it was Ares that recognized the sorceress. The Sentry immediately attacked Morgana and ripped her head from her shoulders, it appeared to be a quick defeat. 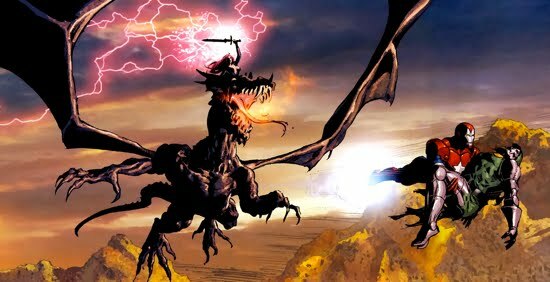 However, moments later The Sentry exploded in a fiery blast as Morgana reappeared in front of Osborn's team. Le Fay had used her ability to rearrange time and return from the past to disintegrate The Sentry. She then unleashed a swarm of demons upon the Avengers, who now found themselves at Le Fay's mercy. 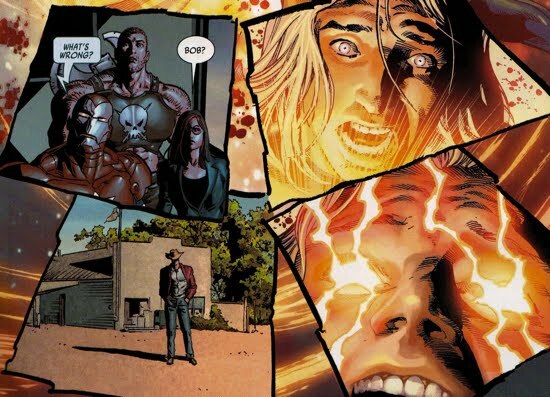 Dark Avengers #3 features a flashback to one of Osborn and The Sentry's earliest encounters, that incredibly significant sequence of events is explored further here. 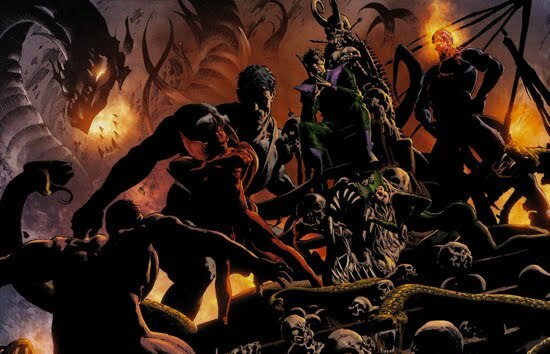 After the flashback the story returned to present day, where Osborn and his Avengers are struggling to hold off the demons brought forth by Morgana. Le Fay turned Ares to stone (since he was a potential threat) and after Bullseye launched a flurry of arrows at the sorceress it appeared she died for the second time. However, she returned once again and this time Osborn knew he had to make a move to defeat her since both Ares and The Sentry had been neutralized. Norman grabbed the incapacitated Doom and demanded that Doom provide him access to his Doom Tech, Doom reluctantly complies. Taking control of the Doom Tech, Osborn opened up a Time Cube, which allowed he and Doom to travel back in time. They arrived in 690 AD (the time of King Arthur Pendragon) where they confronted Morgana in her secret lair. The action continued in Dark Avengers #4 as Norman's team, which he left behind, continued to struggle against Le Fay's demons. Meanwhile back in 690 AD, Le Fay scoffed at Osborn's loyalty to Doom as she pointed out that even he has to be aware that Doom planned on betraying him. Doom, who did not defend himself against Morgana's claims, instructed the sorceress to 'end this now'. Le Fay refused as she claimed that Doom could not kill her since their time streams were too intertwined (thus killing her would have a negative impact on Doom's life as well). So Doom did the next best thing, instead of killing her, he sends to exile back into prehistory, 1 million years ago to be precise. Le Fay was neutralized. 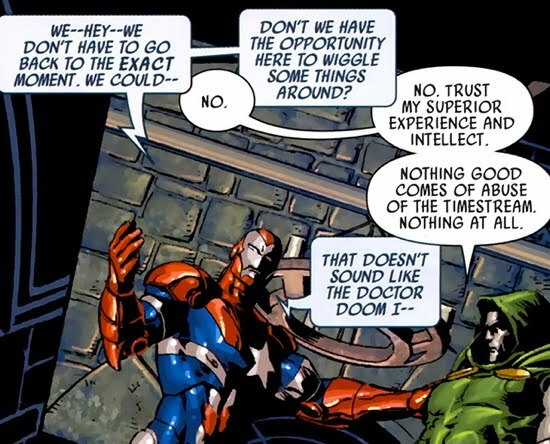 As Doom and Osborn prepared to return back to present day, Norman suggested that they 'wiggle some things around' as he implied some tweaking of the timestream to favor the two of them. Doom quickly vetoed Norman's suggestion, citing that nothing good can come from doing so. It was a very interesting scene as Doom clearly stood as Osborn's intellectual superior an odd twist considering Osborn's capabilities (ie, he's a pretty bright guy in his own right). 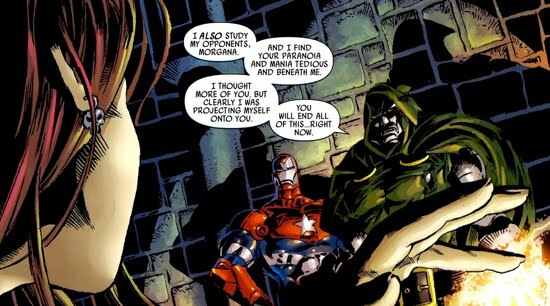 After returning to present time Latveria, Osborn gathered his team and informed Doom that he's now on his own. As Osborn's team took off in their jet, Doom rebuilt his recently destroyed castle. Upon arriving in New York City, Victoria Hand informed her boss about Barton's public attack at Osborn's history (for more on Barton's beef with Osborn check out The Onset and Barton vs. Osborn). Norman immediately scheduled an interview of his own to counter Barton's claims. As the team approached Avengers Tower, they were blinded by a brilliant flash a light and as the light dissipated, The Sentry appeared. He had returned from the dead...or so it seemed. 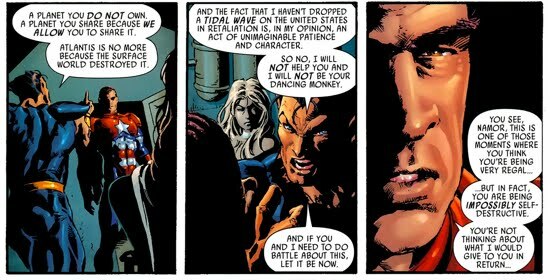 Norman Osborn found himself face-to-face with a seemingly resurrected Sentry at the onset of Dark Avengers #5. The Sentry, just like Osborn, was baffled as to how and why he was able to evade death. He seemed to be teetering on the brink of another meltdown and Osborn tried to preempt that from happening. Norman reinforced the fact that the Void did not exist to The Sentry, but The Sentry was not buying it as he struggled to keep his grip on reality. 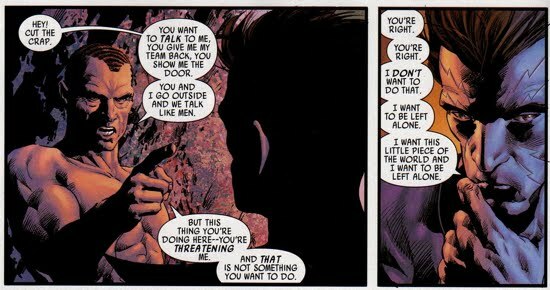 But, unfortunately for Osborn, he had bigger fish to fry, he needed to counter Clint Barton's claims regarding his own mental sanity. 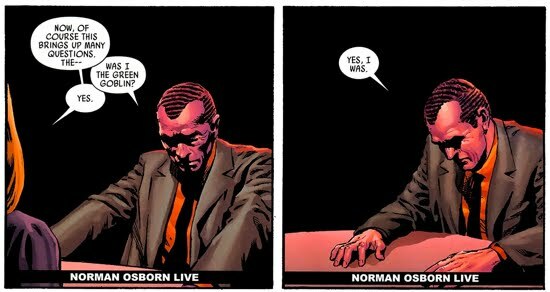 Toward this end, Osborn scheduled a semi-live interview with Shannon Queller (interesting name choice for a news reporter since Norman was trying to quell a rumor). He provided Queller with scripted questions that she was to 'stick to' and after taking a brief second to get in character, he was ready to begin the interview. Osborn opened the interview by stating that he was given a huge amount of trust by the American people and that he believed the country needed and deserved leaders that they can trust. Queller then played a sample of Barton's claims about Osborn and after watching the clip, he confessed to having been the Green Goblin. But, of course, Norman tried to justify why he became the murderous villain. He claimed that he was 'taken advantage of' by 'unsavory people' and that he suffered from a severe chemical imbalance (an imbalance he was born with) that caused him to become a 'very ill man'. He went on to explain that this was not a secret he was trying to hide as he claimed that all of this information was known and prominent in headlines at the time he was outed (Osborn was right, for more click here). Norman did not take the heat for the Green Goblin's activities over the years, he explained to Queller that a lot of what had been attributed to the Green Goblin was not him. Osborn felt this fact was obvious because of the numerous public attacks the Green Goblin had made at him and his family over the years (Osborn was right again, for more click here). He even goes as far as to name Spider-Man as one of the people who donned the Goblin attire and that there was an entire Nightline episode dedicated to Osborn the victim. Getting back to the story, Norman conceded the fact that he was the Green Goblin at one point in his life, but, as he explained to Queller, the important thing was that he sought help and he received it. Osborn then goes on to explain his thoughts regarding Barton's current state of mind. He claimed that Barton may be cracking under the pressure after having witnessed Captain America die and Tony Stark fall from grace. 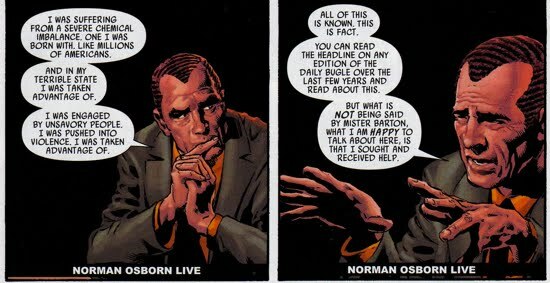 Norman explained further that Barton is not hiding in the shadows concocting conspiracy theories about Osborn while Norman had tried to help him and give him a spot within his initiative. But Norman can not help him because Barton refused his help. Norman also pointed out the irony that when Barton joined the Avengers, he did so as an ex-con and that he joined the team with two other known terrorists (Quicksilver and the Scarlet Witch). Yet Barton would not allow Osborn a shot at redemption in the same manner that he received in the past? After making those insightful comments regarding Barton's past, Norman did one of the most unbelievable things...he prayed to God! Not only did he pray to God to express his thankfulness for the second chance he was given but also for the second chance that the world had been given...what a guy! Norman said he used to pray to God when he was at his worst...he did? Queller went on to ask him about the identities of his team, but Norman would not share that information, he wanted to allow them their privacy. He justified his decision by saying that the American people didn't care who was protecting them, only that they were being protected. As for the rest of Barton's claims (ie that the team is staffed with murderous psychopaths), well, Norman said those accusations are 'just madness'. Norman dodged a major bullet, keeping his reputation in tip-top shape in the eyes of public. Osborn made a habit of putting out fires during his reign, which was a good thing too because there was a lot of fires to put out. And just as Norman seemed to pacify the waves created by Barton, the newsfeed from his interview was interrupted with breaking news. An Atlantean terrorist cell attacked innocent civilians in Los Angeles. The story concluded with a brief affair between Marvel Boy and Ms. Marvel (aka Karla Sofen), after which Sofen confirmed that Osborn's team was filled with murderous psychopaths. This news caused Noh-Varr to flee Avengers Tower, he never returned. His story is continued here. In response to the Atlantean attack on U.S. soil, Osborn summoned his Cabal in Dark Avengers #6. Norman apprised the group as to the specifics behind the attack a proposed a countermeasure to their attack. He asked Namor to first publicly denounce the attack by the Atlantean terrorists and then to lead a black ops to crush the terrorists, killing all but one. He wanted the one remaining survivor dragged through the streets to ensure the American public that everything was under control. Namor flat-out refused, as he claimed that what Osborn perceived as a terroristic threat was actually a sharp retaliation for the threat the surface dwellers have posed to the Atlanteans. The conversation between Norman and Namor gets heated and the Sub-Mariner threatened with more violence from his home world. Norman scoffed at Namor's claims and suggested that he reconsider his actions. He told the prince that he's being self-destructive and not considering what Norman would give to him in return. 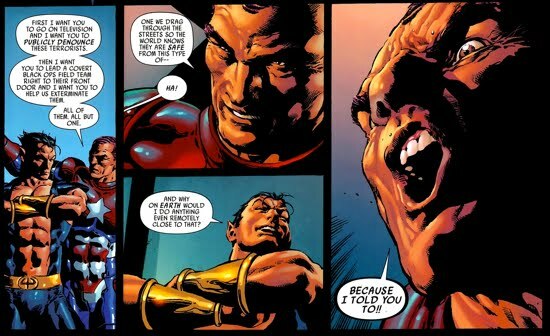 Namor and Osborn would never make amends and their association ended abruptly after Namor turned on him during the X-Men's exile to Utopia, explored here. After the botched attempt at recruiting Namor to do his dirty work, Norman returned to his team and found a handful of the members unaccounted for. Marvel Boy was gone, Ares had not yet reported in and The Sentry was off-radar. Victoria Hand, sensing a potential break-down out of Norman, suggested that he take some time off because he had not slept since he was appointed that position. 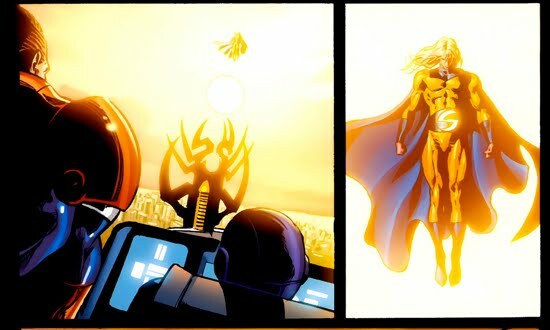 Soon after, The Sentry appeared before the team and, after taking Hand's advice, Norman sent him on a solo mission to destroy the Atlantean cell. He gave The Sentry the same orders he attempted to give Namor (that is, annihilate the cell and leave only one survivor to be dragged through the streets), but instead of asking Bob to do this, Norman requested the Void. The Void would be merciless and Norman knew that, he sought swift justice against the terrorists. The Sentry complied, he unleashed the Void and crushed the Atlanteans in their underwater homes. This is an interesting interaction between Norman and The Sentry, especially given the events of Dark Avengers #13, which is further explored here. Norman had provided The Sentry with The Professor's formula that enabled him to access the Void portion of his personality. So Norman was willingly activating the Void, yet trying to suppress him at the exact same time. Clearly Norman wanted control over the Void to use for his own vices, thus giving Bob the formula to do so, but what Norman was quickly learning was that there was no controlling the Void and The Sentry was slowly slipping out from under Norman's thumb. After The Sentry crushed the Atlanteans, he and Osborn received overwhelming praise and support from the President himself, praise which Norman graciously accepted. To cover his gruesome order, Osborn had H.A.M.M.E.R. give a press release stating that The Sentry attempted to arrest the terrorists, but upon his arrival they detonated a suicide bomb, killing all but one of them. The press release went on to say that that one remaining detainee would be given due process in accordance with the law. But the poor Atlantean did not receive due process, instead he was fed to Venom as a nice sushi snack! As Norman struggled to suppress his demons, an anti-mutant sentiment began sweeping down the west coast and landed at the doorsteps of the X-Men's newest refuge in San Francisco. The conflict between Norman Osborn and Scott Summers is outlined here. 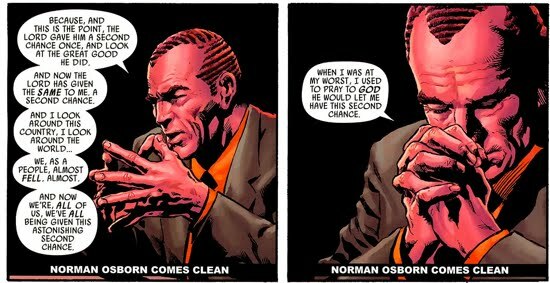 Norman Osborn was fresh off what he considered to be a victory over Scott Summers and his X-Men, but despite that win Norman was still struggling to suppress his own demons. His deputy director, Ms. Hand, was not oblivious to Norman's internal conflict and she became fairly certain he was in trouble when he would not leave his workshop in Dark Avengers #9. Meanwhile, Ares soon realized this his son Aaron (aka Phobos) had left their apartment and was now living with Nick Fury and the rest of his Secret Warriors. The dynamic between Ares/Phobos/Fury is explored further here. While Osborn locked himself up in his workshop, his Avengers team continued to bicker amongst themselves once again proving that the word 'team' is a relative one. But the biggest detriment to Norman's team was yet to come and, of course, it involved his secret weapon The Sentry. After returning to his quarters in Avengers Tower, The Sentry was greeted by his wife Lindy…who shot him point blank in the face with Noh-Varr's Kree blaster. The Sentry's face was melted and it seemed as though he died once again. That was not the case, however, and to follow what happened next for The Sentry click here. Just as The Sentry suffered another seemingly fatal incident, Norman finally emerged from his workshop. The stress on Osborn continued to pile up in Dark Avengers #10 when Betty Simpson, the daughter of the Secretary of State, and her friend vanished without a trace in the small town of Dinosaur, Colorado. The Secretary of State controlled Norman's funding, so he called on the Avenger's leader for a personal favor in retrieving his missing child. Meanwhile, Norman's team was down in the Louisiana Bayou apprehending the Man-Thing and thus checking another item off of Norman's to-do list. After the team returned to New York, Victoria Hand briefed Osborn as well as his Avengers in regards to the 44 missing people (the Secretary of State's daughter being one of them) that have now gone missing in Colorado. 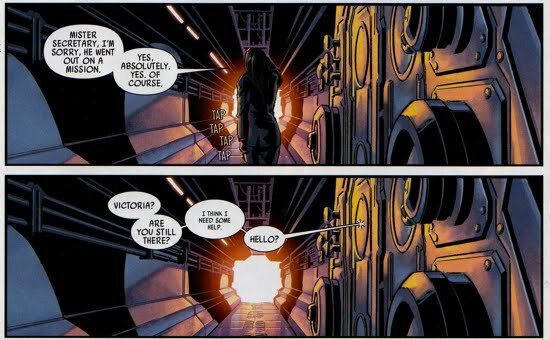 Norman, oddly in the full Iron Patriot armor despite being in the relatively safe environment of the Avengers Tower, decided to heed Victoria's request that he takes things a bit easier and send only The Sentry to Colorado. So the golden Avenger heads only a solo trip to the small town to see if he can uncover anything. Upon arriving, The Sentry noticed the town appeared to be deserted and then suddenly he saw a single figure. 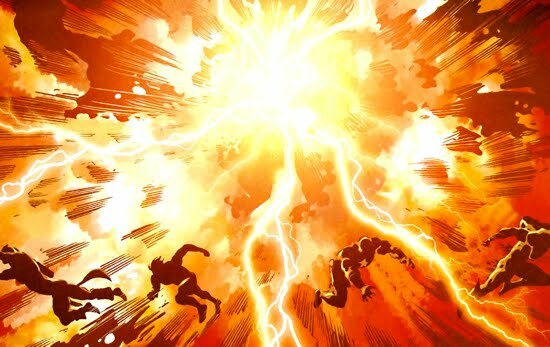 But before Osborn could get any information from his Avenger, The Sentry exploded in a fiery blast! Norman was forced to respond so he and his entire roster headed for Colorado, and when his team got there, he sent Ms. Marvel to ground level to investigate. But she disappeared as well and when Norman looked back for the rest of his fleet they were gone too and he was the only one in the sky. Seconds later, Norman found himself stripped of his Iron Patriot armor, leaving him completely naked, and squared up against an immensely powerful group consisting of The Beyonder, Molecule Man, The Enchantress, Mephisto and Zarathos. Although it seemed like Norman's team had disappeared in front of him, in Dark Avengers #11 it became apparent that Norman had been the one doing the disappearing. Victoria Hand was left in command of the floating world H.A.M.M.E.R. headquarters that was hovering over Dinosaur, Colorado and she was scrambling to figure out what the hell had happened to Norman and his team. Meanwhile, Norman (still naked mind you) was in front of this demonic-looking group and had no idea who he was even staring at. Molecule Man knew Osborn was ignorant of him and his power set, so he explained, Molecule Man can manipulate the molecules that surround him giving him incredible control over his environment. He also claimed that he knew Osborn would come looking for him and after a few instances of incoherent babbling between Molecule Man and his companions, Norman soon realized that Molecule Man's crew was not real. Norman then tried to strong-arm Molecule Man into releasing him and returning his armor, but Molecule Man did not flinch. In fact he explained to Norman that he could kill him right there if he wanted to, but the he wouldn't. He wouldn't do it because he realized that that will cause others to come looking for him and the wave of investigations would never stop. Molecule Man sought simply to be left alone, alone in the small town in which he had claimed to have grown up. Norman told him to leave the country and that he would have no problem with the Molecule Man if he were to do so, but the Molecule Man would not do that. Soon, the Molecule Man began to sense that Norman was not afraid of him at all, so he decided to subject him to a particularly excruciating type of torture. Before Norman knew it, he was atop the Brooklyn Bridge wearing a Spider-Man costume staring into the eyes of a pregnant Gwen Stacy!! Norman continued to hear the Molecule Man whilst experiencing his delusion and the Molecule Man claimed to have infiltrated his memories and to have seen his horrific history. Seeing the pregnant Gwen Stacy caused Norman to lose his footing and fall from atop the bridge (just like she did way back when!). As Norman plunged into the water below, the Molecule Man taunted him further by telling him that everyone is waiting for him to fail and they're waiting for him to snap...so he wanted to accelerate the process on Norman. As Norman frantically fights against the Molecule Man's psychological warfare he's suddenly attacked by demonized version of his long-time foe Spider-Man. But the Molecule Man was not focusing solely on Norman, he had separated all the Avengers so that he could deal with them individually. And deal with them he did, he turned Ares to stone, Bullseye into a drum of angry water, Daken into some kind of plant-like creature, Venom into a pile of goop, and seemingly froze Ms. Marvel. Of course no decimation of the Avengers team would be complete without destroying The Sentry, which the Molecule Man did but not after commenting that he was intrigued by the 'taste' of The Sentry's molecules. After neutralizing Norman's entire roster, the Molecule Man found himself face-to-face with Victoria Hand as she surrendered on behalf of the United States of America. Dark Avengers #12 begins in the midst of a Spider-Man-flavored delusion for Norman as the demonic web-slinger drops him down toward the New York City streets from high above the skies. Meanwhile, Hand continued to negotiate with the Molecule Man the conditions of her surrender and just when she thought she was getting through to him, he teleported her to his fiery lair. 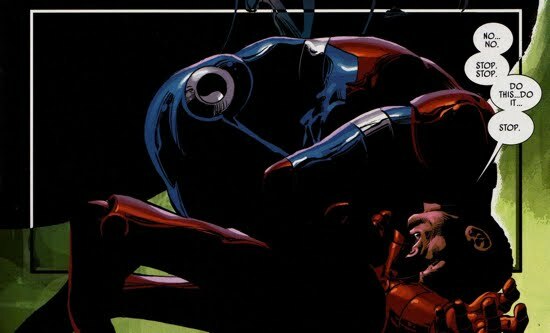 She was not alone, a naked Norman Osborn was there lying completely incapacitated on the ground. Apparently the Molecule Man had a scrambled a few molecules in Norman's brain, which knocked him into oblivion. Suddenly, The Sentry blasted in through the walls of the Molecule Man's lair and the two battle it out. The Sentry appeared to be killed for the fourth (or fifth who's counting at this point?) but this time he quickly bounced back. 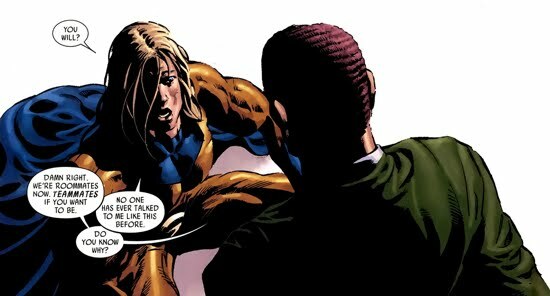 The Sentry turned the tables on the Molecule Man and began ripping him apart at the molecular level. After a few minutes of excruciating pain, the Molecule conceded to The Sentry's demand to restore everything (including the 44 missing persons) as they were. Victoria Hand struggled to wake Osborn, but eventually he came to, just in time to watch The Sentry save the day. 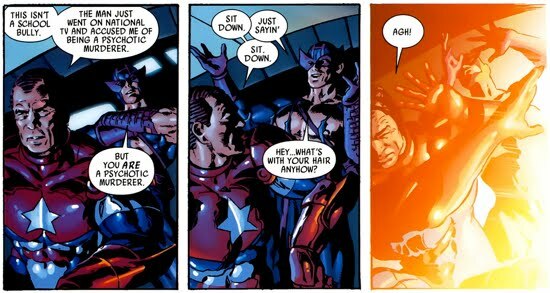 In the aftermath of Molecule Man's attack, The Sentry had an epiphany in regards to his powers. He realized that, like the Molecule Man, he could control the molecules around him and that's how he can do all the things that he does. Despite the victory they had experienced that day, Norman was slowly beginning to realize the magnitude of The Sentry's mental instability and he knew he had quite a problem on his hands. 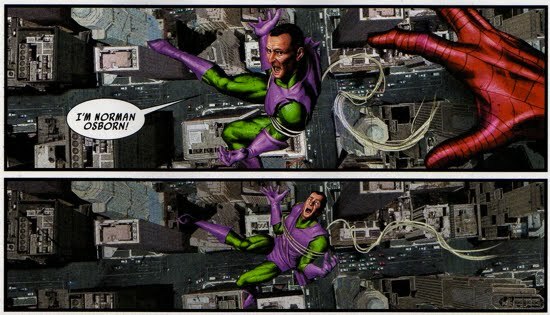 When Norman and his team returned to Avengers Tower, Victoria adamantly insisted that he seek some serious professional help for the constant stress that he has been under and because of the mental-tweeking the Molecule Man had done to him. Norman reluctantly agreed and then retired to his workshop and continued tracking his enemies. Moments later, he collapsed on to the ground clutching his hands to face saying, "why won't this face come off?!?". As Norman writhed on the floor, Loki appeared behind him, clearly the God of Mischief had been manipulating (or at least observing) Osborn's recent actions. Everything that had transpired during Norman's tenure as the director of the national peace-keeping task force H.A.M.M.E.R. was about to culminate in one final act of creating order throughout the United States, his siege on Asgard. Norman's attack and his subsequent downfall is further explored here.